Ever wanted to play with Ben 10 as a team? Here is your chance. In Ben 10 Forever Defense game, you team up with Ben 10, Kevin and Gwen save the world from the attack of Forever Knight’s army! A lot of adventure and fight awaits you with this latest Ben 10 Game. Before you get started, here are some important things you must read if you want to win! 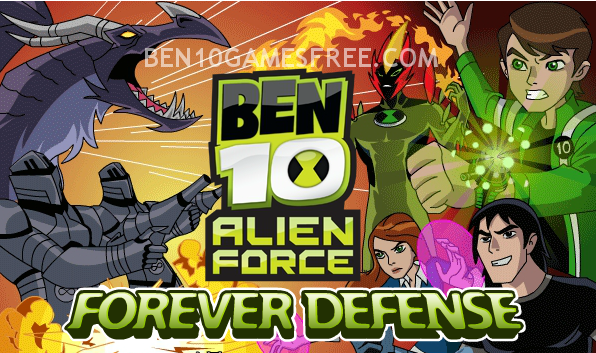 Ben 10 Forever Defense is a typical Ben 10 fighting game based on your favorite Ben 10 Alien Force series. The game features the three main characters from the series i.e. Gwen, Kevin and Ben 10 himself. All three team up to defense the attack of Forever Knight’s army. You must use Ben, Gwen and Kevin’s powers to destroy the army before they destroy you! Recommended: Play Ben 10 Hero Time game online now! This game begins with all three heroes i.e. Ben, Kevin and Gwen ready to take on the Forever Knight warriors. These warrior attack in form of waves that consists of 6-7 warriors each and you have to kill the most of them possible. Ben 10 Forever Defense game is all about coordination between the three characters. You may ask how. Well, there are three kind of warriors – attackers, gunmen, and shieldmen. Attackers are the easiest to kill while gunmen fire back at the team. And, Shielded warriors can only be killed Kevin and not Ben or Gwen. To destroy all of them, you have powers of the heroes. Here is the list of powers of Ben 10 team. Well, that’s all you need to know about Ben 10 Forever Defense game, now it’s your turn to defend the team from the Forever Knight. Team up with Ben, Gwen & Kevin to Defend the World from Forever Knight’s Army. Good Luck!! Don’t Forget to give your rating for Ben 10 Forever Defense Game and share your tips and tricks to win this game in the comments section below.